All of these over-simplified comparisons seduce to conclusions that are very plausible – and very wrong. Such simplified “thinking by comparison” is not the right level to contemplate about thinking itself, and will inevitably keep missing the point. What I’m talking about is not a rare phenomenon, but the way the brain works (and computers don’t). On the contrary, the general advice given by creativity gurus like Tony Buzan is to not try too hard to stick with one topic, but give the brain a chance to do its “background activity”. Actually, the most brain-friendly behavior is to find the specific rhythm of concentration and relaxation regarding brain-work of a kind. While relaxing from one topic, it’s perfectly OK to turn to another. The essential impeding thing is not the interruption or “task-switching” by itself, but the fact that a thinking direction is enforced, thereby disturbing the natural flow of neuronal activities. This may be caused by a telephone call, but also by trying too hard to force oneself to stick to one thing when your natural neuronal flow wants to take you somewhere else. 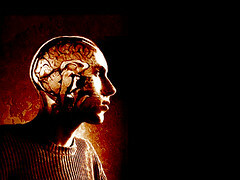 Only a free and relaxed brain can produce thoughts of sufficient “size” for todays brain work. Instead of forcing upon you the chains of “focus”, relax, and rely on your brain natural ability to find its best way to whatever solution.